If you're looking for a cheap Stratocaster, it's worth considering the Squier and non-Fender backed offerings featured on this page. For those of us with less than $400 (or even $300) to spend, you will be pleasantly surprised at the quality at the budget end of the Strat copy spectrum. Plus, there are variations on the traditional Strat spec for those who want a more modern sound. First, a side by side run-down of the top 3 picks. There are some additional mentions further down for those who are looking to spend less than $200, although bear in mind the quality tends to be inconsistent with electric guitars that cheap and full setups are recommended (not for beginners). Defining Features Authentic strat spec designed by Fender. Rosewood fingerboard. Alnico V pickups. 3 color sunburst finish available. Classic general strat spec. Maple fingerboard. Duncan Design pickups. Modified strat spec with bridge humbucker. Coil tap. Slim neck profile. Scale Length 25.5" 25.5" 25.5"
Without doubt the best Stratocaster in the Squier range in production today. Consistently well setup from the factory, with many owners reporting the same impeccable fretwork and finish as with the Classic Vibe Telecaster equivalent. The Alnico V pickups have enough chime to illustrate your clean rhythms resonantly and intricately, if a little on the quiet side. Very well balanced, warm and rich yet with enough high end crispness to give your solos the bite they need. The neck pickup offers some wonderfully chiming bell tones - far more usable in this position than other cheap strats. Only a few have flirted with the notion of changing the bridge pickup (preferably to something with higher output), but this is more a minor tweak of personal preference than the replacement of a cheap part. The "out of phase" positions are where the CV (and in my opinion any Strat worth its salt) shines and instantly deliver that famously smooth Strat tone. Again you have the experienced pickers admitting that a lowly Squier out performs the Mexican and even US Fender standards. At a mere $350 (£280), the CV is only a "cheap Stratocaster" by price tag, and has proved a very exciting purchase for Strat lovers. Considered by many the top player in the Squier range before the Classic Vibe came along. 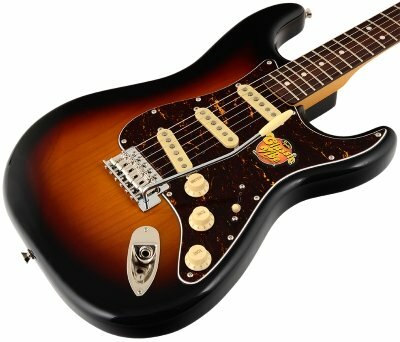 Comparisons have inevitably been made between the Deluxe and the Made-in-Mexico Fender Strats. The general consensus is it's not worth the extra $200 for the MIM. There is also the feeling that Squier's newer models from Chinese factories follow firmly in the footsteps of their highly acclaimed Japanese production era. The basswood body (compared to the more expensive Classic Vibe's alder body) makes the Deluxe especially lightweight. It's a softer wood than alder, so it will dent and ding more easily, but it helps to deliver a slightly warmer tone than your typical Strat brightness and brashness, naturally rounding off any unpleasant ice picky treble. It's a less layered sound, with an emphasis on warm, fat mids rather than low end beef or high end sparkle. Aside from the subtle tonal nuances, the Deluxe captures the full essence of the Strat sound, in all its out-of-phase "quacking" glory, as confirmed by long term strat owners who were intrigued at Squier's higher end offerings. Most users have expressed the desire to keep the stock pickups which, along with the other built-to-last parts, make this a solid "no upgrades" candidate, which is unusual for a guitar of this price. Note you can also get the Deluxe with a flamed maple finish, but most places just stock the two current neutral finishes. The Pacifica series has been around since the mid 90s and has slowly gained its reputation as the budget modified Strat copy. The 112V is the newest model, a marked improvement on the now cheaper 112J which still receives tremendous praise. The bridge humbucker provides you with a beefier output than the classic SSS configuration for high gain and distorted tones, while you can still switch back to the middle-neck single coils for those classically sweet Strat cleans. The 5-way switch is retained to let you experiment with the 112's rich variety of tones. New on the V model is the coil-tap, giving you even more tonal variation. Simply pop up the tone knob to give that humbucker a more traditional single coil vibe. Many players buy this guitar for its neck alone. Slimmer than your standard Strat. Quick, comfortable and ultra playable. Low actions are easily attainable, given that the factory standards have been met. People are constantly praising just how good it feels, before they even mention sound. It's no surprise, then, that shredders are drawn to the Pacifica in the same way they are to Ibanez for their super fast necks. Also impressive is the build and material quality, which truly reveals itself when you test the 112V acoustically. A reliable gigger and a more modern, well rounded alternative to the cheap Stratocaster models offered by Squier, or even the Mexican Fender Standard. If you're on an even tighter budget (i.e. less than $200), or you're just looking for a project guitar for modding, then check out both Guitar Fetish's Xaviere XV-870 and Rondo Music's SX Hawk range. While reviews are hit and miss, both these little-known Strat copies are simply incredible value for money and offered in a wide variety of finishes and specifications. With a professional setup and perhaps a few upgrades, you can be in possession of a high quality Stratocaster for a fraction of the cost of a Fender. These are the go-to guitars for modders.